The Fall 2016 edition of Heard Any Good Books Lately? produced by Triangle Radio Reading Service and brought to you by the Friends of NCLBPH is now live on our homepage and as a podcast from Triangle Radio Reading Service’s website. This edition features the most popular books checked out in the month of September 2016. One of this edition’s feature books reviewed is What We Find by Robyn Carr. 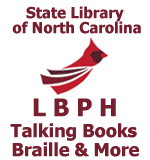 This entry was posted in News, Podcasts and tagged audiobooks, august 2016, bestsellers, book lists, books, braille, fall reading, friends of NCLBPH, heard any good books, nc libraries, north carolina library, podcasts, popular books, reading lists, robyn carr, september 2016, talking books, triangle radio reading, Triangle Radio Reading Service. Bookmark the permalink.